The spirit world encompasses New Orleanians. Spirits haunt, spirits consume, spirits flow like the mighty current of the Mississippi. But the best spirits in New Orleans manifest from more than just the imagination or the hereafter; some spirits ooze from a decanter, a carafe, a spigot, a spout or a flask. The delicious, dangerous spirits poured by a barkeep and consumed in a cocktail are intoxicating phenomena in an alternative spirit world. Nectar of the gods, zenith of man’s pleasure, and solace for the soul… alcohol has been used as an aphrodisiac and as artistic stimulation throughout the centuries. Its euphoric nature is sweet seduction from base to brim, and no alcoholic beverage is more notorious, more mysterious, more outlawed than the elusive concoction of Absinthe. Referred to as “La Fée Verte” or the Green Fairy due to its dazzling liquid of cloudy green colorization, Absinthe became a signature drink for bohemian artists, writers, and poets during turn-of-the-century Europe. Revolutions in art and literature were creating new movements among impoverished actors, unconventional musicians, and other vagabonds such as Toulouse-Lautrec, Picasso, van Gogh, Baudelaire, and Hemmingway. The drink of choice for these iconic revolutionaries was the green muse whose powerful hallucinogenic nature could ignite euphoria and inspire otherworldly ideas. Traditionally served with ice water and a cube of sugar to help take the away the bitter edge in its potent flavor, drinking Absinthe is like partaking in a divine ritual. Placing the sugar cube on a slotted spoon, water is drizzled over the sugar into the glass of Absinthe, turning the greenish liquor to a milky opalescence in an effect called “louche.” Its strong herb liqueur, distilled from flavorful herbs like anise, fennel, and wormwood, give Absinthe a predominately licorice-like taste that lingers on the palette. As the green fairy once winged her way from Paris to the New World, the port city of La Nouvelle Orléans was introduced to Absinthe by French travelers and immigrants. Suddenly the madams of Storyville, the painters such as Edgar Degas, and the writers like Oscar Wilde and Mark Twain were consumed by the Belle Époque of Absinthe. 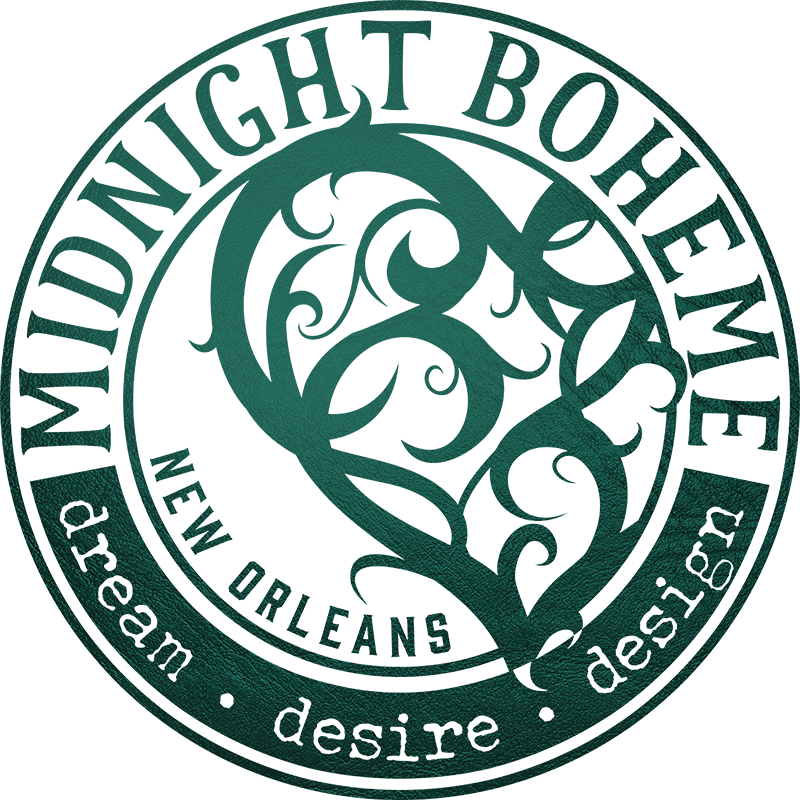 Eventually a copper-roofed establishment known as the Absinthe House opened on Rue Bourbon, filled with chandeliers, marble fountains, and captivated patrons ordering the exotic spirit and watching the mixologist drip cool water over sugar cubes from brass faucets behind the bar. While the Old Absinthe House on Bourbon Street remains a staple of life in Vieux Carré, the endurance of Absinthe ran short in its heyday. Alcoholism known as “absinthism” grew a bad reputation in both Europe and America, the drink eventually banned in 1912 as a dangerously addictive psychoactive drug. Madness and suicides accompanied the drinkers of this poison, a potent hallucinogen that reputedly drove men to murder and insanity. Absinthe has since been revived with the replacement of Herbsaint, an anise-flavored spirit that does not contain wormwood and now houses many cocktails in New Orleans restaurants. This vintage style Herbsaint, a French-Creole name for wormwood or “sacred herb,” is regarded as the spirit of a bygone era of old France in Louisiana, a spirit of New Orleans, a spirit captured in a bottle and sipped through a variety of concoctions, such as the Absinthe Suissesse, the Herbsaint Frappé, and the Sazerac. From gypsy to journalist, from artist to aristocrat, from musician to martyr, Absinthe has served the masses through inebriation and inspiration alike. The art of the drink produces a ministry for many to contribute, its history as potent as its bitters. It is the most misunderstood and mythical alcohol, and to this day it continues to raise spirits and stir up a significant amount of trouble.